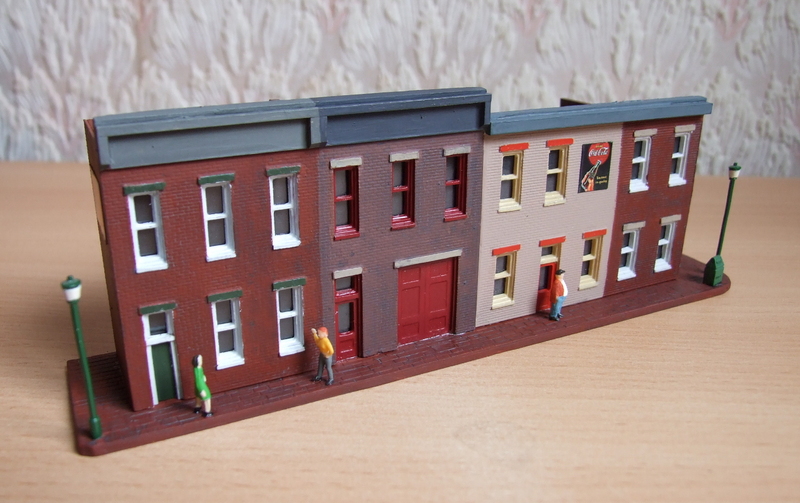 Just finished this short group of low-relief Rowhouses (terraces to you & me) from a couple of spare back walls from DPM kits - the first of many scratchbuilt/kitbashed buildings to be constructed for my new US outline layout. 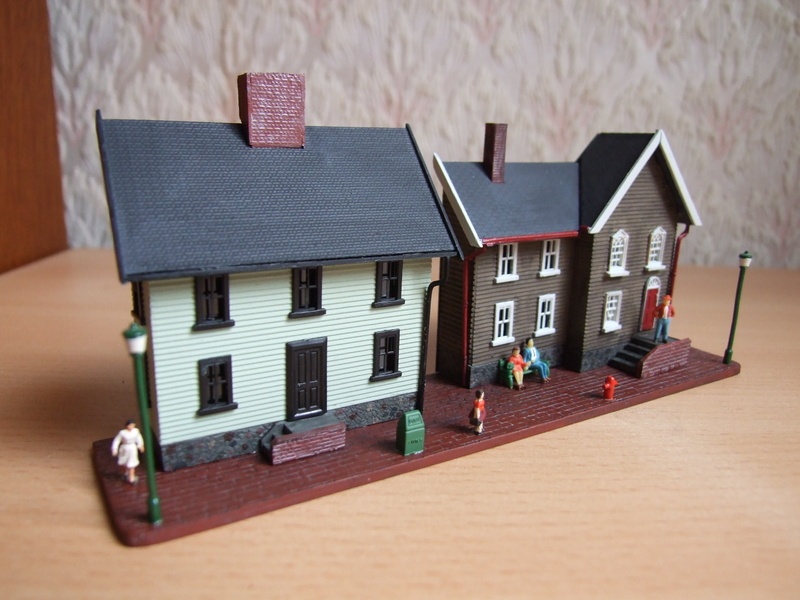 Think they capture the style of the real thing in some eastern US cities, and were considerably cheaper to produce than the "proper" models of such things that are available for an arm and a leg on Shapeways! Yes, those buildings are everywhere in New England, US!! Nice choice of colours, 70000! It made huge difference in appearance. Best regards with my annoying moving signature. I'm going to be building some more at a future date and those ones will be based on various photos I have taken on trips to the US. I took several in Baltimore last October and even took some in Philly on a previous trip - particularly the block opposite Wayne Junction station where the trolleybus turning loop is! These were a quick job basically to fill a space on the backscene and were tailored to the two spare DPM wall sections. As I want my layout to be "a bit different", I'm trying to get away from the DPM/Walthers "identikit" town buildings you see everywhere else by scratchbuilding my own. One of the buildings "on the list" even dates back to 1677...........!! Having spent a couple of weeks in Montpelier, Vermont, a few years back, I can say they have certainly brought back a few memories, so they must look the part. Need a bit of weathering, though. Walking around the Waterloo (London, UK) area yesterday I noted quite a large number of flat roofed buildings with raised parapets. I have confirmed on Google maps that they do not have pitched roofs, so another unexpected use for the DPM kits. Over-user of brackets and quotation marks. Wondering how many pedants can dance of the head of a pin. The plain brick ones have actually been weathered/toned down - it's just the photo doesn't show it very well! A further pair of buildings - wooden "Colonial" style/era ones this time - have been completed for the area by one of the streetcar route termini. They were mainly constructed from parts from one of the Model Power "Grandmas House" kits. Lovely! Now that does remind me of Montpelier! I also took a look at some of your photos. You have clearly travelled the Philadelphia transit system quite extensively and have some great photos, particularly of the trolleys. I find the trolleys fascinating - there are apparently more trolley lines active in Philadelphia than there are in San Francisco (which seems to be the city most associated with trolleys). Perhaps I should consider a trolley layout some day! I've made several visits to Philly over the past 20 years and have used the SEPTA system to get around whilst there as you get more of a feel to the place than following the tourist trails - and I have certainly passed through some "interesting" neighbourhoods, particularly on the trolley lines!! I've actually got a small N exhibition layout based on a freelance "Philadelphia" location (complete with static trolleys), which has been in store for the past 4 years. I've got to get it up and running for a show in June this year, so will post some photos in the "Layout" thread when extracted from its resting place. Only problem is the lack of RTR SEPTA stock in N. There are several items on the Shapeways site, but by the time you buy the shells and then add in the running gear it comes to serious $$$/£££ ! Look forward to seeing the photos of the Philly Trolley layout when you post them. 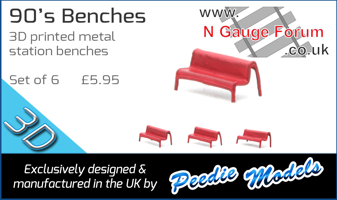 A quick search online threw up some N gauge SEPTA trolleys (who would have thought it), so it has got me thinking. My layout is in the garage in a U shape and above it is a shelf. If I was to lower the shelf a bit I would have enough space for a terminus to terminus trolley system, either double track or single track with a passing loop. Along the back I could have classic Philly architecture, I would need some electric trickery to automatically control the trolley so that it goes out, stops, returns, stops ad infinitum. Suggestions as to how I could automate it are welcome! Yeah, I'm pretty sure that UK company Heathcote Electronics do one as well. Watched the movie "Split" yesterday. This is set in Philadelphia. One of the street shots was the row houses in Clinton Street, I think, near the Pennsylvania Hospital. Brought back memories of my visits in the late 1980s.